The Crew Cab 150 Speed Lift makes loading and unloading your scooter or wheelchair into your crew cab pickup truck easy as can be! This interior vehicle lift uses an elongated arm and works at double the speed of the heavy-duty Crew Cab 225 lift. 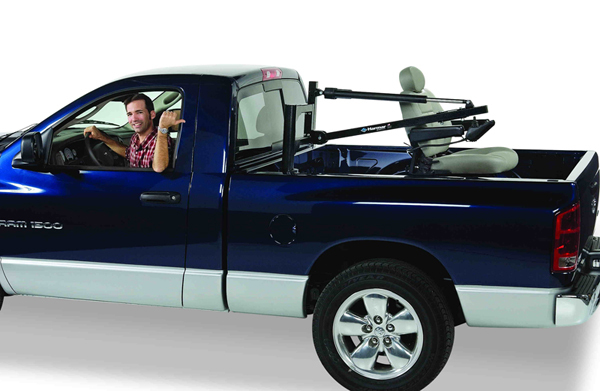 An anti-rotate strap system and compact base ensure a superior fit in your truck bed. The lift will transport your mobility device directly from your truck bed to either the passenger or driver side door. Simple hand controls and a dash-mounted switch leave the power of the Crew Cab 150 lift at your fingertips even from inside the vehicle!